Deconvolution: Recovery of an object from an image that is degraded by blurring and noise. In microscopy the blurring is largely due to diffraction limited imaging by the instrument; the noise is usually photon noise. 3D images. The measuring process "spreads" the light away from the original source: this is convolution. Deconvolution means taking this spread light back to the original point, and for that you first have to measure how it spreads out: 3D measuring. (Images from Wide Field Microscopes are a particular exception to this general case, where you can still deconvolve 2D planes). But a classical picture of a 3D object like those taken by your photographic camera is not a 3D image, not even a 2D slice of your object, but a 2D projection of the object. You don't register what happens with the light going out from the different parts of the object, but just the light reaching your camera from all the points at the same time. Deconvolving this kind of image using algorithms intended for volume images has not any scientific sense, despite there are other 2D deconvolution methods that can be applied. Linear imaging processes. Linear means that two different light signals (or of any other nature, in general) coming from two different points of the object do not interfere with each other. The resulting image of two emitting points is equal to the addition of the images that would arise by measuring the two points separately. This linearity doesn't occur in all physical systems, and applying deconvolution to non-linear images is totally wrong. Optical images. Huygens Software considers that all the WaveLengths involved in the image are light wavelength in a range close to the visible. Other imaging systems, like electron or proton microscopy, involve wavelengths of different order of magnitude, and the lenses, if existing, are of different nature. Scaling our algorithms to these ranges may be tricky if we want to generate a theoretical Point Spread Function (PSF). In any case, if the user manages to measure an experimental PSF, the deconvolution can always be applied, as long as the two previous points are fulfilled. Out of these points, deconvolution does not have any scientific validation for non-optical images, but still can be used to beautify some non-optical images as if it were a "Photoshop" image filter. The Microscopic Parameters and the Restoration Parameters have no longer any physical meaning, and you just vary them until you get a nice result. An example follows. Below is a restoration test using a.o. 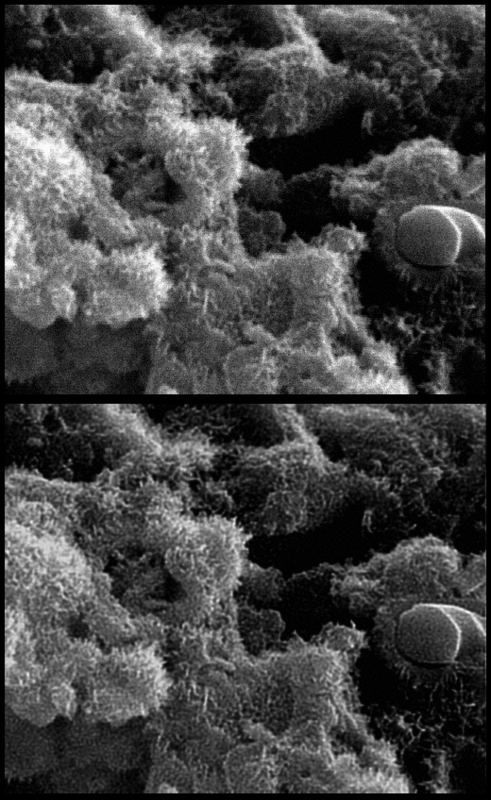 the Huygens software fir the enhancement of an SEM image. The material was prepared and imaged by Hanlie Grobler, Laboratory Manager, Centre for Microscopy, University of the Free State, Bloemfontein, South Africa. The images are from a microbial biofilm (supplied by Department of Microbial, Biochemical and Food Biotechnology). (The specimen is typically coated by sputter coating with 60nm gold. Huygens parameter files compiled by Prof. P.W.J. van Wyk (Director: Centre for Microscopy). Huygens Essential was used for deconvolution. Care must be taken not to include in the image any maximized black/white areas such as text or scale bars. Deconvolution algorithm - CMLE, Maximum iterations 2 (optimized), Signal to Noise: 20, Quality threshold: 0.2, Bleaching correction - If possible. The final deconvolved image is stored as 256 gray (8bit) TIF file. The image is verified as non-destructive or manipulated by superimposing the original image with the new deconvolved image in Adobe Photoshop CS5, by setting the deconvolved image layer to have a transparency between 20-80% (depending on the darkness level of the final deconvolved image). Below is another restoration test using Huygens Professional with a 2D (projection) ScanningElectronMicroscopy (SEM) image of a ceramic. Up: original SEM image: fracture surface of a tetracalcium phosphate/dicalciumphosphate dihydrate cement. (Taken by Dr. Jaime Franco at the Instituto de Cerámica de Galicia, Universidade de Santiago de Compostela). Down: Restored image, "deconvolved" with Huygens Professional. Parameters: Microscope Type: Confocal Microscope, Sampling Distance: 50x170 nm, Numerical Aperture (NA): 1.3, Lens Immersion Medium: oil, Emission Wavelength: 500 nm, Signal To Noise Ratio (SNR): 20.